The ‘80s were a wild time for music. Bass turned synthetic, jeans turned into lycra, and instruments turned into the most futuristic versions of themselves. The guitar was transformed in a variety of ways, from getting covered in zebra print to losing its head. Headless guitars, though, have outlasted both zebra print and the lycra. Headstocks are often taken for granted as a given in guitar design alongside the body and neck. But creative luthiers like Steinberger have been challenging this standard for decades, producing high-quality instruments without heads, and sometimes even without bodies. 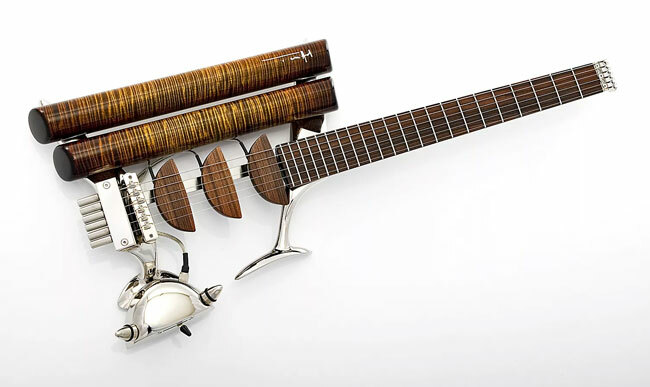 Decades into their existence, headless guitars are still fairly uncommon and largely unseen in the mainstream guitar world, giving these futuristic instruments an air of the exotic. Where do they come from and how do they work? Maybe the most glaring question about headless guitar design is where do the tuners go? Do headless guitars even have tuning machines? In fact, the tuners migrate all the way to the opposite end of the guitar, placed behind the bridge. This unconventional but savvy design places all of the hardware in one location. Having everything in one place eliminates the need for a nut, which is a boon for your open notes and intonation in general. There are also several ergonomic benefits to ditching the headstock. Without that extra wood and hardware at the end of the neck, balance of the guitar shifts to the body, alleviating the strain on your strap shoulder. Many headless luthiers, like Strandberg, offer chambered bodies, typically reducing the weight to between 5 and 6 pounds. The headless guitar’s total body length is also much shorter. With the tuners at the base of the bridge, the body has to cut off right there, trimming the inches of extra wood that are typical of, say, a Strat. Some models have horns or other features that extend on either side of the tuners, but the tuning machines themselves are where the heart of the instrument stops. Suddenly, the body of a guitar with a 25.5” scale isn’t much longer than the scale itself. The general consensus is that Ned Steinberger was the first designer to achieve real success with his headless models, which originated when he worked for bass luthier, Stuart Spector. Steinberger himself actually got the gig for his work as a designer and sculptor, not a luthier. This background gave him a perspective outside of traditional guitar shapes and trends. His first headless model for Spector was the L2 bass, which went on to win several design awards. 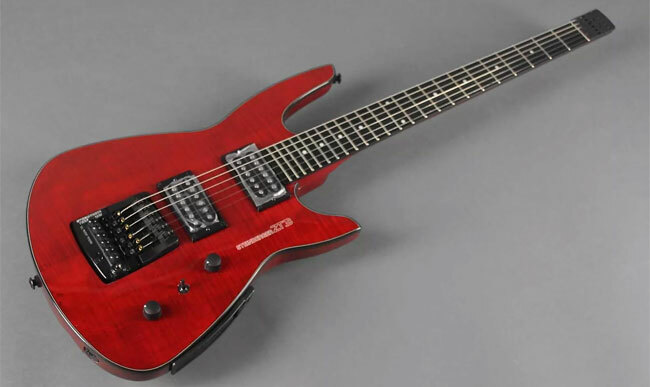 Steinberger formed his own company in 1980 and has continued to produce models like the famous Spirit, and most recently the ZT-3. 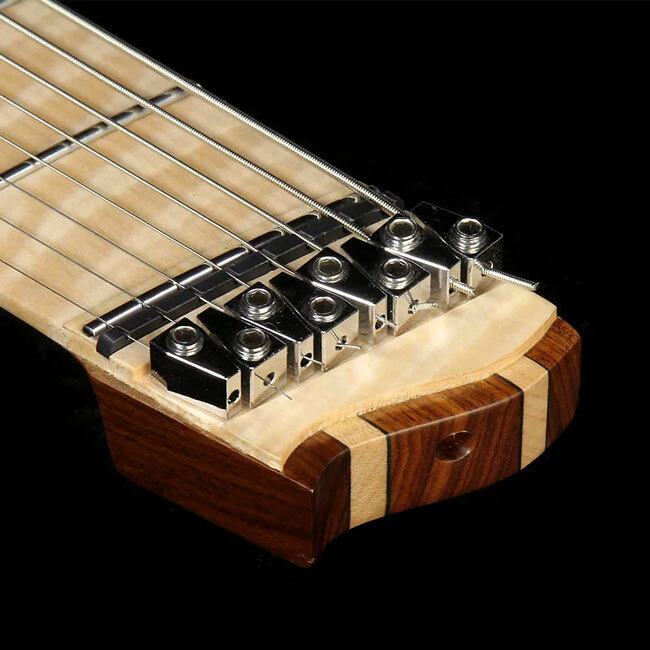 Steinberger also innovated the TransTrem, a unique tremolo system bends entire chords while maintaining precise intonation. The next noteworthy mention goes to Teuffel guitars with the Birdfish model. Even in the bizarre world of headless guitars, this is a truly unique work of art. Brainchild of luthier Ulrich Teuffel, the Birdfish debuted in 1995 and has enjoyed acclaim for its design and impeccable tone. The Birdfish doesn’t have a “body” to speak of, but instead features two removable wooden bars (dubbed “tonebars” by Teuffel) that act as the main resonant structure. Both of the tonebars and all three of the guitar’s pickups can be swapped out with ease, adding even more versatility. The origin of modern headless is still alive and well, and Ned Steinberger’s designs have continued to morph and improve on themselves since the ‘80s. The Spirit is the most well-known Steinberger shape for guitars and basses, and the Synapse series shares this cigar–box–style body shape while including all of Ned’s biggest innovations over his years of production. Both can regularly be found for well under $1000, making them by far the headless guitars on the pocket. The most recent model is the ZT–3, shaped similarly to the more conventional looking GM model and sporting the TransTrem system. Notable Steinberger players include Paul Masvidal of Cynic, Buck Dharma of Blue Oyster Cult, Shania Twain’s and George Jones’s guitarist Dan Schafer, and Ken Sinnaeve aka “Spider” of Loverboy. In 1990, Ned Steinberger started NS Design which currently specialized in headless, solidbody electric versions of orchestral string instruments. The company’s current line also features a gorgeous headless bass guitar. Founded in 2007 by Swedish native Ola Strandberg, this company has become known for versatile, ergonomic instruments that found a niche in the progressive and metal communities. Strandberg has a few interesting approaches to neck design. Most of its models utilize multiscale fretboards with fanned frets. Additionally, the company’s patented Endur-Neck makes use of a flat surface where the thumb follows the neck to better grip. Finally, the company’s necks are contoured, ergonomically guiding wrist position up the neck. Strandberg guitars have made their way into the hands of musicians like Tosin Abasi and Javier Reyes of Animals As Leaders, Aaron Marhall, and Yvette Young of Covet. Plini, Paul Masvidal, and Per Nilsson all have their own signature models. 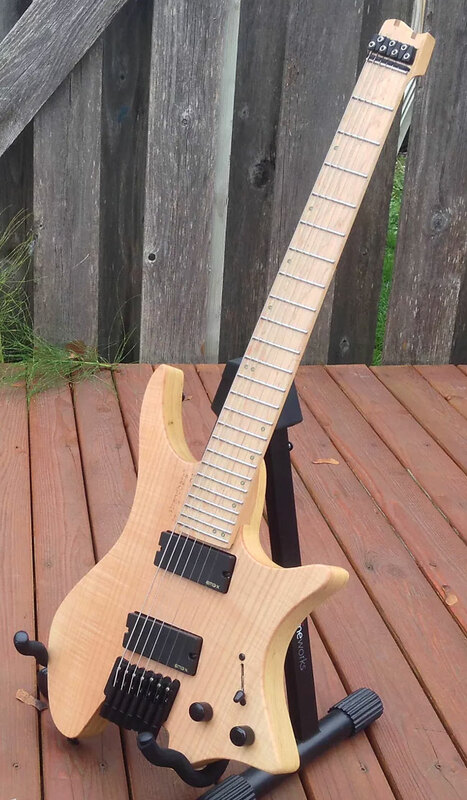 The Boden OS 6, OS 7, and OS 8 (the numbers refer to the number of strings) are the entry point to the brand, typically running between $1,500 and $2,000 for the stock models. High-end models include its artist signature series and the Boden J series, manufactured in Japan. And if you’re looking for the ultimate guitar tailored to you, Strandberg has their “Made to Measure” line. The wait list is long and the price tag steep, but everything is customizable, and the neck and fretboard are measured to fit your hands and tailored to your playing style. Kiesel guitars is up there with Strandberg and Steinberger as one of the most recognizable headless brands. While the majority of Kiesel’s instruments have headstocks, the company produces the headless Vader guitars and basses with various amounts of strings, as well as the Allan Holdsworth HH2 signature model. The HH2 was originally manufactured by Carvin, but the model is now made by Kiesel, with the two companies owned by the same family. 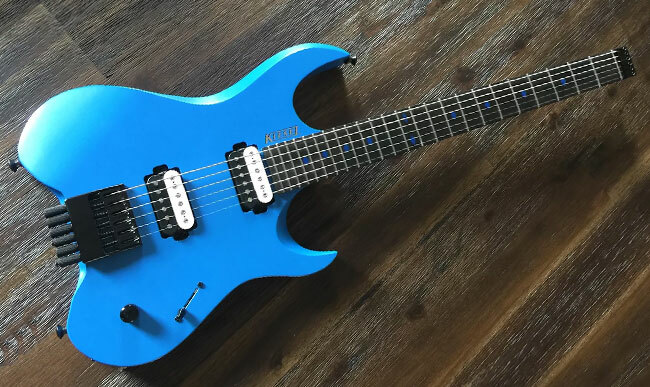 Some Kiesel headless models can be found for under $1,000 on the used market, but the majority float somewhere between $1,000 and $1,500 when purchased directly from the company. As with most guitars and brands, the more strings an instrument has, the more expensive it’s going to be. On top of Allan Holdsworth, Kiesel headless models are played by the likes of progressive metal guitarists Chris Letchford of Scale The Summit and Clay Gober of Polyphia, as well as Wes Thrailkill of Mammoth. This Polish guitar company made waves at NAMM this past January with its two new headless Hydra models, a 6–string and a 7–string version. These guitars may well become big with the metal community like many of Mayones’s others. Some interesting features on the Hydra includes a clamp at the top of the neck to conceal the balls of the strings and a carefully contoured neck to ease playing on the upper frets. Pricing for these guitars hasn’t been announced yet, but the company makes high-end guitars that tend to sell for somewhere between $2,500 and $5,000. While Teuffel is likely best known for the Birdfish, this is not the company’s only headless model. 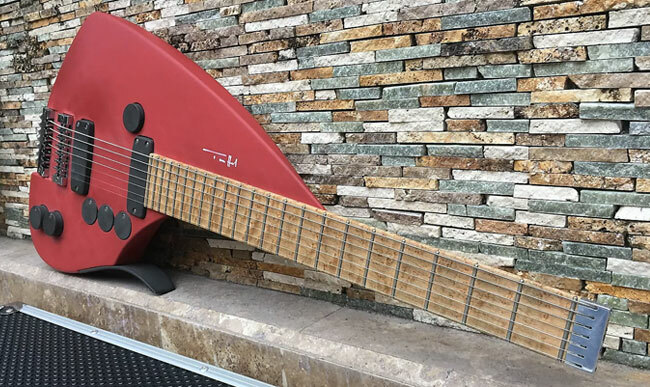 Teuffel also makes the headless Tesla, a slightly more traditional model featuring an asymmetrical body, three pickups, tremolo, and multiple control configurations across four models. The Classic and Studio Tesla models are strange beasts but conventional guitars, while the MIDI version offers MIDI converters in addition to standard pickups. There is also a seven–string model. Teuffels have made their way into the hands of players such as Billy Gibbons, Kirk Hammett, Hanz Zimmer, and Page Hamilton, a resounding endorsement for the quality of these instruments. The original Traveler started as a personal project for designer Leon Cox –– his idea for a minimalist, highly portable guitar developed into a hugely successful brand, owing to the guidance of industry veterans Corey Oliver and Carey Nordstrand. These days, Traveler sports over a dozen models ranging across electric, acoustic, and bass guitars. It’s Ultra–Light and Pro Series guitars take cues from Steinberger’s cigar–box designs while it’s EG–1 and EG–2 models riff on the classic single and double cutaway designs like the Les Paul and Stratocaster respectively. Traveler is also the most affordable brand on this list, with few of its guitars exceeding $500. The low cost reflects an overarching brand philosophy of putting simple, dependable, travel–ready guitars in players hands.